NERF WARS happens the first and third Saturday of every month where we open our 11,000 sq. ft. gym facility to all out warfare. Children bring their own Nerf guns, while we provide over 5,000 bullets. Some Saturdays will be a shoot out where we allow children free range of the padded facility to shoot each other with the foam bullets, while other Saturdays will be a battle against Red/ Blue teams. Nerf Wars is open to ALL AGES, that means, YES you can jump in too mom! We sell safety glasses for $4 if you do not have your own, as safety glasses are required. At 8 pm we open our group fitness room to pizza for an additional $5 for 1 slice, a cookie, and a water OR $7 for 2 slices, a cookie, and a water. Upon arrival of Rumble Training Center, we have the legal guardian sign a wavier and pay with our staff at the front desk, this will approximately take five to ten minutes so prepare in advance for that. 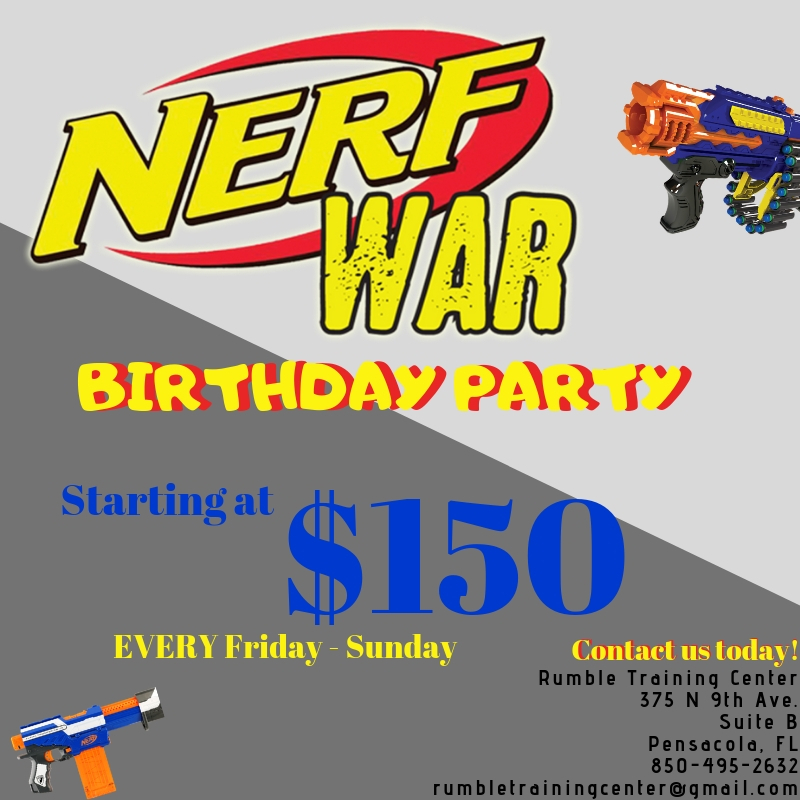 We also host Nerf Wars birthday parties too! We look forward to having you join us for Nerf Night! !